Credit: Bundesarchiv Bild 101I-457-0065-36, Russland. Background: XXXXVIII Panzer Corps (also: XXXXVIII Army Corps or XXXXVIII. Armeekorps), was a corps-level formation of the German Heer which saw extensive action on both the eastern and western fronts during World War II. In the context of the encirclement of Sixth Army in Stalingrad, Stavka postponed Operation Saturn until 16 December, as Soviet forces struggled to clear German defenders from the lower Chir River. 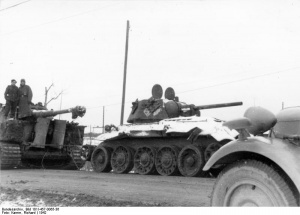 The Red Army’s offensive in the area commenced on 30 November, involving around 50,000 soldiers, which forced Manstein to use the 48th Panzer Corps in an attempt to hold the area. In response, the 5th Tank Army was reinforced by the newly created 5th Shock Army, drawn from existing formations of the South-Western and Stalingrad Fronts; the 5th Tank Army totaled nearly 71,000 men, 252 tanks and 814 artillery guns. The Soviet offensive succeeded in tying down the 48th Panzer Corps, originally chosen to lead one of the main attacks on the Soviet encirclement.The Soviets were forewarned of the impending German assault when they discovered the German 6th Panzer Division unloading at the town of Morozovsk, as a result, held back several armies from the attack on the lower Chir River to prepare for a possible breakout attempt by German forces inside Stalingrad.